I had a very full weekend, and I enjoyed every second. I’m just going to jump right into it. On Friday morning I met Beth and Caitlyn for coffee at Jet City Espresso. Tampa people, have you been here? This was my first time, and I loved it! The owner lives in the house attached to it, and the coffees and scones are all her own recipe and her own creations. Plus, seeing all her running and triathlon bibs behind the counter did sell me on it a little bit. I will definitely be going back for the experience. We sat there for about an hour before they had to head off to work. I headed home and changed into my swimsuit to finally get in a swim for the week. It was pouring rain, but there was no lightning or thunder, so I went ahead anyways. Then I ran again afterwards. For the rest of the day on Friday Tim was off, so we hung out a little when he wasn’t having to work on his MBA homework. I’ll be honest about this MBA thing, I’m super proud of him, but I will be so ready for it to be done when it is. It is a very time consuming program, and I miss being able to hang out with my husband a lot of the time. Also on Friday, I loaded my bike up and took it over to Flying Fish to make my next big investment. I got clipless pedals and the shoes to go with them. Because I still know basically nothing about cycling, I end up asking a lot of questions of friends and then trust the cycling shop. They were doing 30% off these triathlon Specialized shoes, and I got Shimano SPD pedals. I knew going into it about how much it was going to cost, and I’m excited what it will do for my biking. Friday night we got takeout and I headed to bed early. I was excited for my Saturday morning plans that included a BodyPump and BodyCombat release party down in St. Pete with Tori, Meg, Meghan, and Patrick. The class was great, and I’m still sore two days later. The day turned into a marathon of fun. After the class we sat at Starbucks chatting for a couple of hours and then headed to lunch at Red Mesa Cantina. It was one of those days that the conversation just flowed and we were chatting and having such a great time that the camera or phone didn’t make it out of my bag once to take a picture. Sunday morning I took my bike to the Suncoast trail to get in my first ride with the pedals. I’m happy to report that I didn’t fall, but my legs were definitely still stiff from the Les Mills stuff the day before. I didn’t end up getting as long of a ride in as I wanted, but I was happy with where I ended up. I spend Sunday afternoong at the Best Damn Race bloggers party that I’ve been excited about! There was a pretty big group of ladies there, and it was fun to see familiar faces and meet new ones that I’ve only interacted with via comments and emails. Nick, the founder of Best Damn Race, invited people who had blogged about the race in the past to the party, and we were all given goodie bags with $20 to spend at the running store we were at as well as other little things inside. I saved mine and will probably wait until I think of something specific that I want to use it. There was a run before the party, but I knew I wasn’t going to run so wore normal clothes. Then it seemed like time flew by! The gathering started at 5 and we didn’t leave until 7:30! We just chatted about everything running themed under the sun. 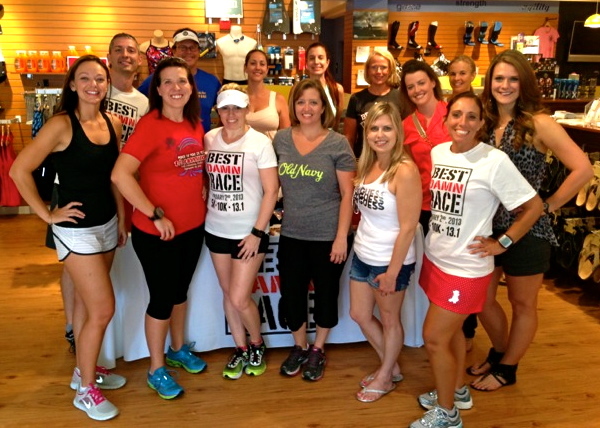 It’s fun to get together with a huge group of runners and triathletes. I always like hearing about goal races, workout plans, gear opinions, and other people’s views on things. I grabbed a picture with Tori and Beth as we were leaving with Nick’s car in the back. I love that he’s so passionate about his race (which is expanding to Orlando and Jacksonville for 2014) that he turned his car into a driving advertisement. It was a great night! It poured down rain on the way home, and for most of the weekend really, but luckily it didn’t stop anything that I had been planning from happening. I thought it was a great idea for Nick to get together people who had already blogged about the event. We hadn’t been asked to in the past, and he was just thinking us for doing it on our own. I loved that gesture! Oh, and he gave us a $5 off Best Damn Race code to share. I just wanted to mention that I paid for my race entry this year, and I’ve already paid full price and registered for next year, so I’m just sharing this to help anyone else out, because I really do like the race. The $5 off code is BDRBLOG. How were your weekends? Did you do anything especially fun? So nice to finally meet you at the blogger party. It was a great time! Such a fun weekend! I'm excited for you with the clipless shoes and pedals- I haven't ventured out clipless yet, but I've been meaning to try it! You had a busy weekend! Happy I got to see you twice! Where should we ride on Thursday? Hmmmmm…. Yay for clipless shoes! I am excited to hear more as you try them out! Ohh yay for them expanding the Best Damn Race to Jax!! Sounds like a great weekend – I love those times when you're with friends and the conversation flows so well, hours pass and you don't even realize it – they are the best! Congrats on the clipless pedals and shoes! I've only done them at spin class so I can't imagine what it's like on the open road! You are brave, girl! Your weekend sounds great! The blogger meet up looked great, too! I seriously wish I had half of the energy/workout determination as you do! The Best Damn Race party looks so fun! Love your top too! I'm always jealous of those blogger get togethers! They always look so fun! And are those cupcakes?! Yum! how fun that the owner lives in a house connected to the coffee shop and makes the scones and coffee!! i bet everything is delicious!